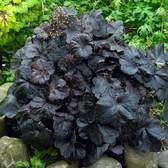 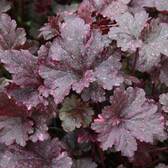 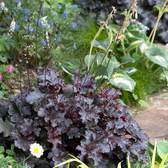 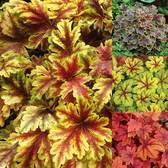 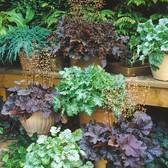 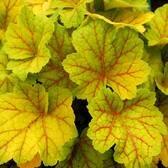 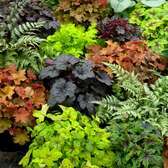 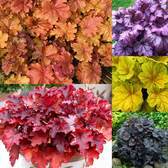 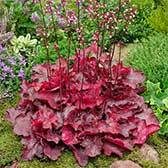 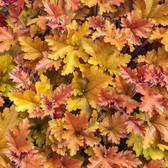 Famed for their truly amazing and spectacular foliage, Heuchera plants are a real luxury for garden lovers. 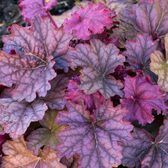 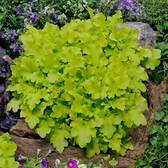 In late spring and early summer Heuchera produce flowers, but the real attraction comes from their evergreen or semi-evergreen foliage. 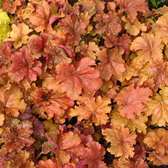 Growing to heights of only 30-50cm, these medium sized perennials are hardy and disease resistant. 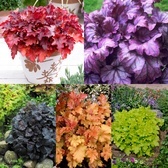 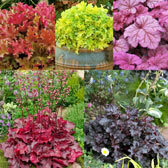 Ideal for growing in border, rockeries or in patio containers, try mixing Heuchera together for a rainbow colour effect. 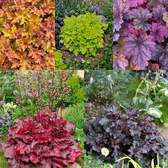 The variation and range of colours available is unmatched by any other dwarf evergreen perennial.